Genomic gains and losses are a result of genomic instability in many types of cancers. BRCA1- and BRCA2-mutated breast cancers are associated with increased amounts of chromosomal aberrations, presumably due their functions in genome repair. Some of these genomic aberrations may harbor genes whose absence or overexpression may give rise to cellular growth advantage. So far, it has not been easy to identify the driver genes underlying gains and losses. A powerful approach to identify these driver genes could be a cross-species comparison of array comparative genomic hybridization (aCGH) data from cognate mouse and human tumors. Orthologous regions of mouse and human tumors that are commonly gained or lost might represent essential genomic regions selected for gain or loss during tumor development. To identify genomic regions that are associated with BRCA1- and BRCA2-mutated breast cancers we compared aCGH data from 130 mouse Brca1 Δ/Δ ;p53 Δ/Δ , Brca2 Δ/Δ ;p53 Δ/Δ and p53 Δ/Δ mammary tumor groups with 103 human BRCA1-mutated, BRCA2-mutated and non-hereditary breast cancers. Our genome-wide cross-species analysis yielded a complete collection of loci and genes that are commonly gained or lost in mouse and human breast cancer. Principal common CNAs were the well known MYC-associated gain and RB1/INTS6-associated loss that occurred in all mouse and human tumor groups, and the AURKA-associated gain occurred in BRCA2-related tumors from both species. However, there were also important differences between tumor profiles of both species, such as the prominent gain on chromosome 10 in mouse Brca2 Δ/Δ ;p53 Δ/Δ tumors and the PIK3CA associated 3q gain in human BRCA1-mutated tumors, which occurred in tumors from one species but not in tumors from the other species. This disparity in recurrent aberrations in mouse and human tumors might be due to differences in tumor cell type or genomic organization between both species. The selection of the oncogenome during mouse and human breast tumor development is markedly different, apart from the MYC gain and RB1-associated loss. These differences should be kept in mind when using mouse models for preclinical studies. Western women have a 10-12% risk of developing breast cancer, making this disease the most common malignancy in females . Approximately 5-10% of breast cancer cases can be explained by a hereditary predisposition. Between 25-40% of these cases involves the inheritance of one defective copy of either the BRCA1 gene or the BRCA2 gene [2–5] which predisposes women in these families to a ~50-80% lifetime risk of developing breast cancer and to a lesser extent ovarian cancer . BRCA1 and BRCA2 proteins are implicated in DNA double strand break (DSB) repair and loss of BRCA function results in chromosomal instability, hence to cancer predisposition [6–8]. Chromosomal instability can be evaluated by array-based comparative genomic hybridization (aCGH) which measures genomic copy number alterations (CNAs) in sample (tumor) DNA relative to normal (diploid) DNA . 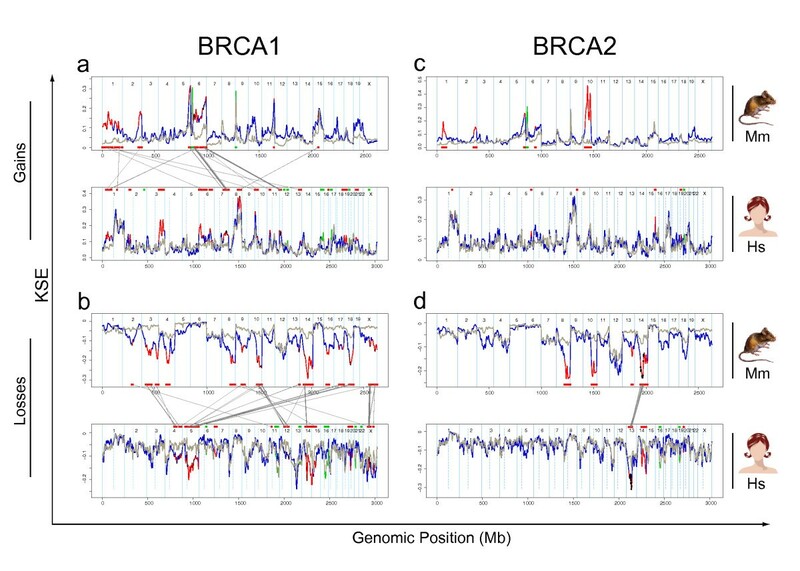 Analysis of the recurrent regions of chromosomal instability in BRCA1 or BRCA2 mutated breast tumors may point to loci and/or genes involved in development and progression of BRCA-associated hereditary breast cancer. To gain insight into the specific effects of BRCA1 or BRCA2 loss on genomic instability, we used aCGH profiles of genetically defined mouse models for BRCA1- and BRCA2-associated breast cancer as biological data filters to mine the human breast cancer genome [10, 11]. In these mouse models breast cancer is driven by combined loss of p53 and BRCA1 or BRCA2. The mouse p53 Δ/Δ mammary tumors are a mix of basal carcinomas and carcinosarcomas, whereas the mouse Brca1 Δ/Δ ;p53 Δ/Δ and Brca2 Δ/Δ ;p53 Δ/Δ tumors are mainly basal-like. Human BRCA2-mutated tumors resemble sporadic tumors in that they do not skew towards any phenotype , whereas, 90% of human BRCA1-mutated tumors have a basal like phenotype [10, 12, 13]. Of note, tumors from our mouse models do not give rise to ER-positive luminal tumors, which is the cell type of 70-80% of human sporadic and BRCA2-mutated breast tumors [14, 15]. It is well known that human basal-like and luminal human breast tumors have different aCGH profiles ; therefore, the comparison of aCGH profiles of mouse Brca1 Δ/Δ ;p53 Δ/Δ carcinomas with basal-like human BRCA1-mutated tumors may give results relevant for basal-like breast tumors as well as for BRCA1-loss. Syntenic regions that are found recurrently gained or lost in both human and mouse have a greater probability of being relevant for development of BRCA-associated and/or sporadic breast cancer . To analyze syntenic genomic regions for overlapping CNAs, we applied two statistical frameworks to BRCA1-deficient, BRCA2-deficient and BRCA1/2-proficient control mouse and human breast cancers: a total of six tumor groups. First we used KC-SMART , which identifies significantly recurrent gains and losses within each tumor group. Next, we identified syntenic CNAs that co-occurred in both the mouse and human BRCA1-mutated, BRCA2-mutated and control tumor groups. Our data indicate that amplification of the MYC locus and loss of the RB/INTS6 locus occurs in all mouse and human tumor groups, and that AURKA amplification occurs in mouse and human BRCA2-mutated tumors. We also applied comparative-KC-SMART which identifies gains and losses that occur significantly more often in one tumor group compared to another. We used this method to find CNAs that occur more often in BRCA1- or BRCA2-deficient breast tumors compared to BRCA-proficient control tumors. Next, we identified which of these CNAs occur both in mouse BRCA1- or BRCA2-deficient mammary tumors and in human BRCA1- or BRCA2-mutated tumors. Together, our KC-SMART and comparative-KC-SMART analyses highlight important genotypic similarities between mouse and human cognate cancers. However, we also find several genomic aberrations to be highly recurrent in one species but not in the other. We bred cohorts of K14Cre;Brca1 F/F ;p53 F/F female mice, K14Cre;Brca2 F/F ;p53 F/F female mice, and K14Cre;p53 F/F female mice. Cre recombinase expression in these mice is restricted to cytokeratin-14 (K14) expressing epithelial tissues, including mammary gland epithelium. We isolated DNA from 35 Brca1 Δ/Δ ;p53 Δ/Δ , 62 K14Cre;Brca2 Δ/Δ ;p53 Δ/Δ and 33 p53 Δ/Δ mammary tumors as well as (tumor-free) spleens from the same animals. Tumor type was scored by histopathology and by expression levels of vimentin and E-cadherin: both histopathology procedures and expression array procedures were previously described in . All animal experiments were approved by the local ethical review committee. Mouse tumor aCGH profiles were obtained using a microarray containing 3080 unique mouse bacterial artificial chromosome (BAC) clones spotted in duplicate, as described previously . Hybridizations were done as described in Chung et al., 2004 with minor modifications. In brief, we labeled 2 μg of tumor DNA with Cy5 and 2 μg reference (spleen) DNA with Cy3 and vice versa for the dye swap (Universal Linkage System, Kreatech Biotechnology, Cat# EA-006) according to the manufacturer's protocol. All hybridizations were performed in a hybridization station (Tecan, Cat# Hs4800). Data, including detailed hybridization protocols were added to the public repository Array Express with accession numbers E-NCMF-34 and E-NCMF-35 . The intensity of the Cy5 (tumor) signal was calculated relative to the intensity of the Cy3 (reference) signal for each spot on the array and this ratio was log2 transformed. Data was normalized by shifting these ratios by the median log2 ratio per sub array. Dye swap data (a total of four spots per data point) were combined using the Rosetta error model . Each mouse tumor DNA sample was isolated from fresh tumor tissues and hybridized against a reference DNA (spleen) obtained from the same animal to avoid picking up DNA copy number variations between mice. To compare aCGH profiles from mouse with human BRCA1- and BRCA2-mutated tumors, we used two previously published aCGH datasets [22, 23]. For the cross-species comparison: we used 27 human BRCA1-mutated and 28 BRCA2 related breast tumors for the KC-SMART analysis, and compared them with 48 control tumors of different cell types in the comparative-KC-SMART analysis. Pathology, tumor type, and BRCA1- and BRCA2-mutations of human tumors are shown in Additional file 1. All experiments with human materials were approved by the local ethics review committee. (Kernel Convolution - a Statistical Method for Aberrant Region detection) determines which CNAs are significantly recurrent within a tumor group . KC-SMART generates a Kernel Smoothed Estimate (KSE) for gains (KSEgains) and losses (KSElosses) separately across the genome and across a group of tumors. Briefly, at the genomic midposition of each BAC probe, KC-SMART places a Gaussian kernel with the height of the sum of either the positive log2 values or the negative log2 values of all tumors within a tumor group. KSE curves (one for gains and one for losses) are point estimates determined by convolution of locally weighted kernel functions such that the closer the genomic distance between two probes the more they will contribute to each others convoluted values. Significance cut-offs are calculated for gains and losses separately using the distribution of KSE peak heights from randomized data (P < 0.05) as explained in . detects CNAs that occur significantly more often in one tumor group compared to another. The algorithm creates a KSE curve for each individual tumor by placing Gaussian kernel functions with the height of the log2 value and at the genomic midposition of each probe (without separating gains and losses, as done for KC-SMART analysis). For each genomic position in the KSE curve, the KSE values from one tumor group are compared to the KSE values from another group by calculating a signal to noise ratio (SNR). We determined a cutoff that defines significant SNR values by applying a False Discovery Rate (FDR) of 0.05 on the SNR data and randomized SNR data using 6000 class-label permutations. The width of a kernel applied to each data point determines the sensitivity of smoothing and the size of aberrations detected. To compare mouse and human tumor groups we consistently used one kernel width for all tumor profiles. We found that, when using a 20 Mb kernel width, KC-SMART best smoothed noise while detecting CNAs from aCGH profiles of both mouse and human individual tumors. To identify the genomic locations of the peaks of a KSE curve, we calculated for which position the KSE value was higher (for gains), or lower (for losses), compared to the values of its neighboring datapoints. While in many instances a peak may be a local maximum or minimum within a larger gain or loss, these local peaks are part of the data and might harbor interesting genes that drive the larger gain or loss. An R-package of the KC-SMART algorithm (which includes the comparative-KC-SMART algorithm) is included in Bioconductor . We used the BioMart data-mining tool in Ensembl Build 52 to cross-reference two Ensembl datasets (NCBI Build 36 and NCBI Build 37). Because NCBI Build 36 was used to map the mouse RP23-BAC clones, we mapped the genomic positions of the mouse genes using this older build. However, in order to use the most current mouse-human orthologue information, we matched the ENSMUS numbers of NCBI Build 37 with their genomic positions as listed in NCBI Build 36. We obtained a list of 19589 unique mouse-human homolog combinations. 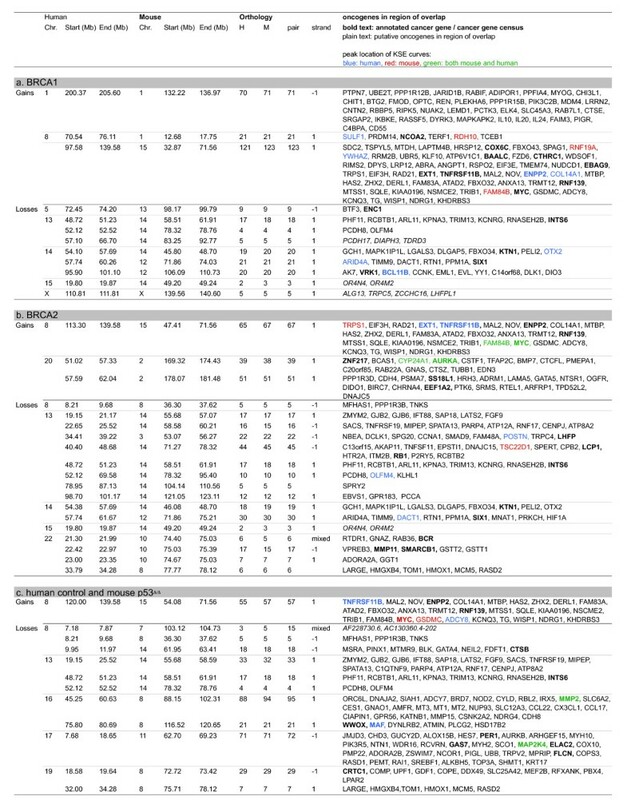 In this list we found 16679 unique human genes and 17048 unique mouse genes (one human gene may have more than one mouse homolog and vice versa). We determined which genes from this list map to the significantly gained or lost regions as determined by KC-SMART method or to the differentially gained or lost regions as determined by the comparative-KC-SMART method for the human and mouse tumor groups separately. Next, we queried for those genes whose homologues map to regions gained or lost in both the human and the mouse tumor sets. The locations of these genes in the mouse and human genome are plotted by connecting lines to their syntenic regions. Genomic locations of the overlapping syntenic regions were determined by taking the genomic position of the start of the first gene and the end of the last gene. To investigate the impact of BRCA1 and BRCA2 deficiency on chromosomal instability in breast epithelial cells, we performed aCGH on mammary tumors derived from our genetically engineered mouse (GEM) models for BRCA1- and BRCA2-associated breast cancer [10, 11]. Mammary tumors in these mice arose from epithelial-specific loss of p53 alone (n = 33), or in combination with BRCA1 (n = 35) or BRCA2 (n = 62). Typical examples of aCGH profiles from Brca1 Δ/Δ ;p53 Δ/Δ , Brca2 Δ/Δ ;p53 Δ/Δ and p53 Δ/Δ tumors are shown in Figure 1a. All but one tumors in the Brca1 Δ/Δ ;p53 Δ/Δ tumor group were of basal cell type, consisting of primarily high grade invasive ductal carcinoma not otherwise specified (IDC-nos; 91%), 3% carcinosarcomas and 6% adenomyoepitheliomas (previously described in ). Likewise, 90% of the Brca2 Δ/Δ ;p53 Δ/Δ tumors are carcinomas and 9% are carcinosarcomas. In contrast, the p53 Δ/Δ tumor group consisted of mixed cell types: 39% intermediate to high-grade IDC-nos, 50% carcinosarcomas and 11% adenomyoepitheliomas. Tumor type scoring was based on histopathology and E-cadherin/Vimentin expression, Table 1, (for tumor type data see Additional files 2 and 3). aCGH profiles of mouse mammary tumors. aCGH profiles typical of (a) Brca1 Δ/Δ ;p53 Δ/Δ , Brca2 Δ/Δ ;p53 Δ/Δ and p53 Δ/Δ mammary tumors. Each dot represents the averaged log2 ratio (y-axis) of a BAC clone plotted at its genomic position (x-axis). Red dots (gains) and green dots (losses) represent datapoints with log2 ratios significantly different from 0 as determined by the Rosetta error model ; black dots represent datapoints with log2 ratios not significantly different from 0. Blue vertical lines represent chromosome boundaries. (b) aCGH profiles from 35 Brca1 Δ/Δ ;p53 Δ/Δ tumors (blue), 62 Brca2 Δ/Δ ;p53 Δ/Δ tumors (orange) and 33 p53 Δ/Δ tumors (gray) were analyzed with KC-SMART using a kernel width of 20 Mb, for gains and losses separately. Significant CNAs are depicted in the color matched bars on top (gains) and below (losses) the Kernel Smoothed Estimate curves (KSEs) for each tumor group. (c) The mean percentage of BAC clones ± S.E.M. with absolute log2 ratio > 0.3 is greater across the Brca1 Δ/Δ ;p53 Δ/Δ tumors (blue) and Brca2 Δ/Δ ;p53 Δ/Δ tumors (orange) tumors compared with the p53 Δ/Δ tumors. P-values are determined by a two-tailed t-test with unequal variance. (d) Each individual tumor aCGH profile was smoothed using KC-SMART (kernel width: 20 Mb). For a range of thresholds, all gains exceeding a positive threshold and losses exceeding the same negative threshold were counted and averaged over each tumor group. Curves are darkened at thresholds for which the average number of CNAs per tumor group is significantly greater in the Brca1/2 Δ/Δ ;p53 Δ/Δ tumors compared with the p53 Δ/Δ tumors, P < 0.05 determined by a two-tailed t-test with unequal variance. Histopathology of Brca1 Δ/Δ ;p53 Δ/Δ , Brca2 Δ/Δ ;p53 Δ/Δ , p53 Δ/Δ mammary tumors, determined by H&E and/or vimentin, SMA, as previously described in . We used the KC-SMART method  to identify significantly recurrent genomic aberrations in the aCGH data of the mouse mammary tumor groups. Figure 1b shows Kernel Smoothed Estimate curves (KSE curves; see Methods) for gains and losses separately for the Brca1 Δ/Δ ;p53 Δ/Δ , Brca2 Δ/Δ ;p53 and p53 Δ/Δ tumor groups. Aberrations that exceeded the significance thresholds are indicated by color-matched bars above (gains) or below (losses) the KSE curves, and their genomic positions are listed in Additional file 4. Significantly recurrent gains (chromosomes 5, 6, 9-cen, 11-tel and 15) and losses (chromosomes 4, 7-tel, 8, 10-tel, 12, 14, and 18) overlapped between all tumor groups. 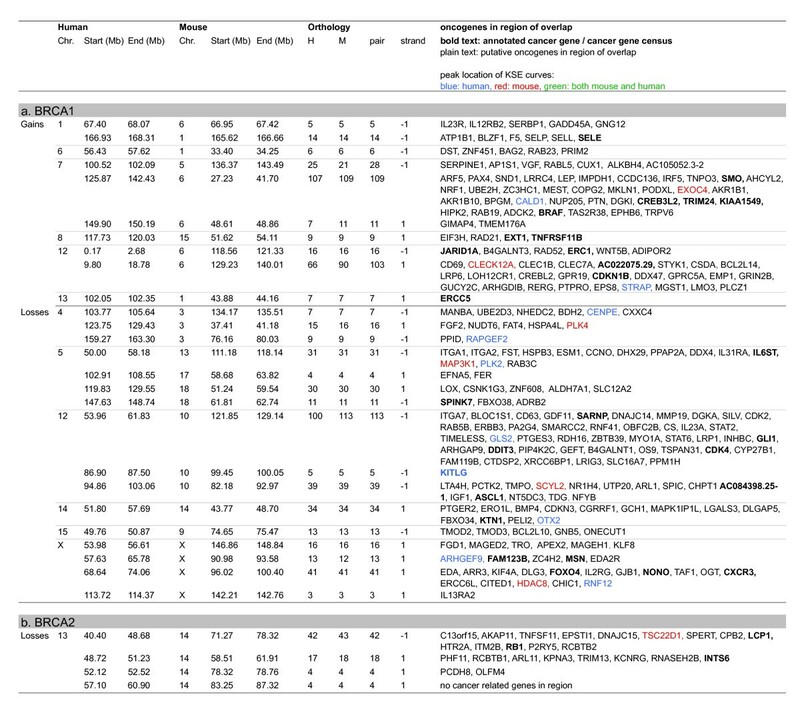 Regional gains on chromosomes 1, 2, 10, 17, 19 and losses on chromosomes 3, 13, 16 and X were common to both Brca1 Δ/Δ ;Trp53 Δ/Δ and Brca2 Δ/Δ ;Trp53 Δ/Δ tumors but not to Trp53 Δ/Δ tumors. In addition, a high level amplicon on chromosome 10 occurred in >50% of the Brca2 Δ/Δ ;Trp53 Δ/Δ tumors. Compared with the Brca1 Δ/Δ ;Trp53 Δ/Δ tumor group, the Trp53 Δ/Δ tumor group showed more whole chromosome gains and losses, rather than regional aberrations. The Brca2 Δ/Δ ;Trp53 Δ/Δ tumor group appeared to be an intermediate version of both extremes. To quantify the level of genomic instability for each tumor group we calculated the mean percentage of BAC clones with log2 ratio >0.3 for gains and <-0.3 for losses separately and found that this percentage was significantly higher for the Brca1 Δ/Δ ;p53 Δ/Δ and Brca2 Δ/Δ ;p53 Δ/Δ groups compared with the p53 Δ/Δ group (Figure 1c). Also the Brca1 Δ/Δ ;p53 Δ/Δ group had significantly more losses than the Brca2 Δ/Δ ;p53 Δ/Δ group. Next, to quantify the amount of CNAs in each individual tumor we smoothed their individual aCGH profiles with KC-SMART (without separating gains and losses) and determined the mean number of peaks in the KSE curves exceeding a range of KSE thresholds. We found that the average number of CNAs was significantly higher in the Brca1 Δ/Δ ;p53 Δ/Δ tumor group compared with the p53 Δ/Δ tumor group between thresholds of 0.04 - 0.54, and significantly higher in the Brca2 Δ/Δ ;p53 Δ/Δ tumor group compared with the p53 Δ/Δ tumor group between thresholds of 0.06 - 0.62 (Figure 1d). To exemplify the regions counted, we depicted the regions exceeding an arbitrary threshold of 0.15 in line-plots (Figure 2). Overall, gains and losses that occurred in the p53 Δ/Δ tumor group also occurred in the Brca1 Δ/Δ ;p53 Δ/Δ and Brca2 Δ/Δ ;p53 Δ/Δ tumor groups but in a greater fraction of tumors, and with higher log2 ratios. Hence, Brca1 or Brca2 loss on top of p53 loss appears to aggravate the tumor profile. Gains and losses of individual mouse tumors. To visualize gains and losses of each individual mouse tumor we smoothed their individual CGH profiles with KC-SMART (without separating gains and losses) and depicted the regions which exceeded an arbitrary threshold of 0.15 in line-plots. For those tumors for which the tumor type was known, we stratified according to tumor type. For each tumor depicted in each line, the tumor type information is given in Additional file 3. After stratifying the p53 Δ/Δ tumors according to tumor type, we found that the carcinomas and adenomyoepitheliomas have significantly more genomic instability compared with sarcomas (Figure 3). 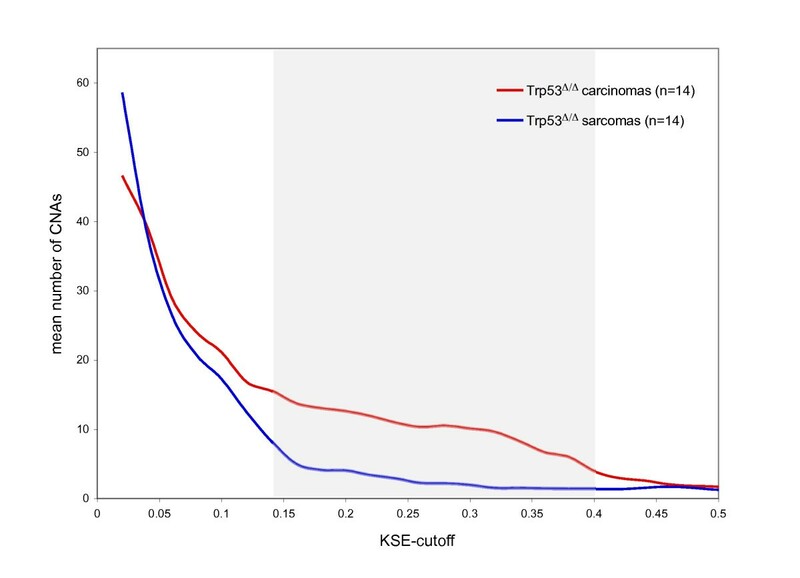 This could explain why the KSE curves from the p53 Δ/Δ tumor groups (which contain both carcinosarcomas and carcinomas) remain at lower level compared with the KSE curves from the Brca1 Δ/Δ ;p53 Δ/Δ tumor and the Brca1 Δ/Δ ;p53 Δ/Δ tumor groups which contains mainly carcinomas (Figure 1b). Genomic instability of mouse p53 Δ/Δ mammary tumors: carcinomas and sarcomas. The 33 p53 Δ/Δ tumors consisted of 14 sarcomas, 14 carcinomas/adenomyoepitheliomas and the tumor type of 5 tumors was unknown. To find the difference of genomic instability between carcinomas and sarcomas we smoothed each individual tumor CGH profile using KC-SMART (kernel width: 20 Mb). For a range of thresholds, gains exceeding a positive threshold and losses exceeding the same negative threshold were added and averaged over each tumor group. Between KSE cutoffs of 0.14 and 0.4, the amount of CNAs is significantly different between carcinomas and sarcomas, calculated with a two sided t-test, P < 0.05, and shown by a gray background. We compared aCGH data from our Brca1 Δ/Δ ;p53 Δ/Δ , Brca2 Δ/Δ ;p53 Δ/Δ and p53 Δ/Δ tumor groups with aCGH data from previously published BRCA1-mutated, BRCA2-mutated and control human breast cancers [22, 23]. First, we assessed the genomic instability of the human tumors by calculating the mean percentage of BAC clones with log2 ratio >0.2 for gains and <-0.2 for losses separately. The mean log2-ratio of the gains and the losses in the aCGH data of human tumors was lower compared to the mouse aCGH data (data not shown); hence, a lower cutoff was used to calculate the percentage of BACs reporting gains or losses in the human CNAs. This percentage was significantly higher for the gains of the BRCA1-mutated tumor group but not for the BRCA2-mutated tumor group when compared to the sporadic control tumors (p = 2.5 × 10-3 calculated with t-test with unequal variance) (Figure 4a). 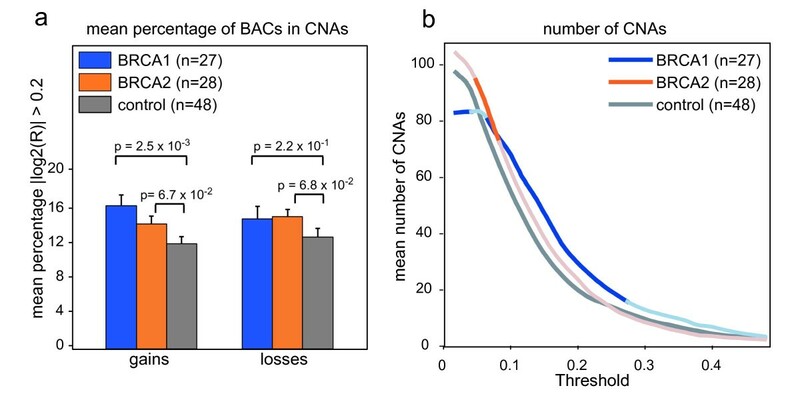 The fraction of losses in the BRCA1 and BRCA2 tumor groups were not significantly different from The fraction of losses found in the sporadic control group. Next, to get an indication of the amount of CNAs in each tumor group, we smoothed the individual aCGH profiles with KC-SMART and determined the mean number of gains and losses in the KSE curves exceeding a range of thresholds. The BRCA1-mutated tumor group had significantly more CNAs compared with the sporadic control tumor group between thresholds of 0.08 - 0.24. The average amount of gains and losses in the BRCA2-mutated tumor group was not significantly increased compared with the control group except between thresholds of 0.06 and 0.08 (Figure 4b). Genomic instability of human BRCA1-mutated, BRCA2-mutated and sporadic control breast tumors. (a) The mean percentage of BAC clones ± S.E.M. with absolute log2 ratio >0.2 is greater in across the 27 BRCA1-mutated tumors (blue) and 28 BRCA2-mutated tumors (orange) compared with 48 sporadic control tumors. P-values are determined by a two-tailed t-test with unequal variance. (b) Each individual tumor aCGH profile was smoothed using KC-SMART (kernel width: 20 Mb). For a range of thresholds, all gains exceeding a positive threshold and losses exceeding the same negative threshold were counted and averaged over each tumor group. Curves are darkened at thresholds for which the average number of CNAs per tumor group is significantly greater in the BRCA1/2-mutated tumors compared with the sporadic control tumors calculated with a two sided t-test with unequal variance, P < 0.05. Using aCGH data from genetically defined mouse mammary tumors as a data filter to mine the human breast cancer genome may be a powerful strategy to identify genomic regions with functional relevance for breast tumorigenesis . To identify and narrow down regions with highest relevance for BRCA related tumor formation, we compared the array-CGH profiles of human BRCA-mutated and sporadic breast tumors with profiles from mouse BRCA-deficient and -proficient mammary tumors. First, we performed a cross species analysis using KC-SMART , which identifies significantly recurrent CNAs within each tumor group. 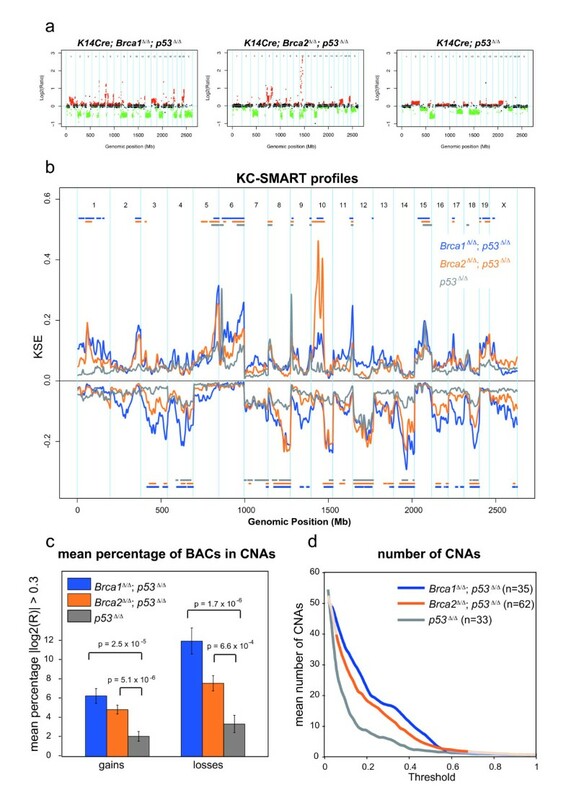 Second, we adapted KC-SMART to comparative-KC-SMART which identifies CNAs that occur with significantly different frequency in one tumor group compared to another (see Methods). Next, we performed cross species analysis using comparative-KC-SMART, which identified regions that occurred in BRCA-mutated tumors but not in BRCA-proficient tumors (or vice versa) in both human and mouse breast tumors. The following paragraphs describe the identification of cross-species syntenic gains and losses. However, they also show the challenges of interpreting cross-species genomic data. We used the KC-SMART method  to identify significantly recurrent CNAs in mouse and human breast tumors and compared them between the two species (Figure 5). Regions of significant gain or loss determined by KC-SMART are shown in Additional file 4 for mouse tumors and in Additonal file 5 for human tumors. For comparison of mouse and human CNAs, we used a synteny list of human genes and their mouse orthologues (see Methods for details). Overlapping CNAs in our cross-species comparison, and the cancer-related genes that map within these regions are listed in Figure 6 (single overlapping genes were left out, for complete list see Additional file 6). We identified human and mouse KSE peak locations and depicted the closest cancer-related genes in Figure 6. Cross species KC-SMART analyses: overlapping recurrent CNAs of human and mouse breast tumors. We analyzed aCGH data from mouse and human tumor groups with the KC-SMART algorithm using a kernel width of 20 Mb. Kernel Smoothed Estimate (KSE) curves are shown for gains and losses separately. For each human-mouse comparison, the upper section shows the KSE curve of the mouse tumor group (Mm) and the lower section shows the human tumor group (Hs). Regions that are gained or lost significantly more often compared to random are depicted in red above or below the KSE curves. Genes that map to a syntenic region of significant gain or loss are plotted in red on the KSE curves and are connected with gray lines between the species. The KSEs of the aCGH data were scaled such that the significance threshold determined by KC-SMART analysis was set at 1 for gains and at -1 for losses. (a) Top panel: the gains on the mouse Brca1 Δ/Δ ;p53 Δ/Δ tumor group linked to the gains of the human BRCA1 tumor group (bottom panel). (b) Top panel: the losses on the mouse Brca1 Δ/Δ ;p53 Δ/Δ tumor group linked to the losses of the human BRCA1 tumor group (bottom panel). (c,d) Idem: mouse Brca2 Δ/Δ ;p53 Δ/Δ and human BRCA2 tumor groups (e,f) Idem: mouse p53 Δ/Δ and the human control tumor groups. The genomic locations of MYC, RB1, AURKA and ERBB2 genes are shown. Cancer related genes that map in the overlapping regions are shown in Figure 6 (reduced list) and Additional file 6 (complete list). Genes in overlapping recurrent CNAs of human and mouse breast tumor determined by cross species KC-SMART analyses. Overview of genes in regions found by cross species KC-SMART analysis (Figure 5): listed are genes that map to significantly recurrent regions of gain and loss that overlap between (a) human BRCA1-mutated breast tumors and mouse Brca1 Δ/Δ ;p53 Δ/Δ mammary tumors, (b) human BRCA2-mutated breast tumors and mouse Brca2 Δ/Δ ;p53 Δ/Δ mammary tumors, (c) human control breast tumors and mouse p53 Δ/Δ mammary tumors. The syntenic genomic regions on the human and the mouse genome are listed as well as the amount of mouse genes (M) and human genes (H) mapping within one region of overlap and the amount of unique orthologies for each pair of mouse and human genes (pair). The strand inversion between the two species (when more than one gene maps within the region): 1: no strand inversion, -1: strand inversion. Cancer related genes that map to the regions according to the Atlas of Genetics and Cytogenetics in Oncology and Haematology [44, 45], and the Cancer Gene Census [46, 47] are listed: annotated cancer genes and genes from the Cancer Gene Census are shown in bold type, putative cancer related genes are shown in normal type. Cancer related genes that map closest to the human KSE peak are shown in blue, genes that map closest to the mouse KSE peak are shown in red, and genes that map to the mouse AND human KSE peaks are shown in green. Overlapping regions with only one orthologue are not shown, for a complete list, including genes removed and added see Additional file 6. We identified one overlapping gain recurrent in all six tumor groups on human chromosome 8q (mouse chromosome 15). In all mouse tumor groups, the peak of this gain was located at (for Brca2 Δ/Δ ;p53 Δ/Δ and p53 Δ/Δ tumors) or near (for Brca1 Δ/Δ ;p53 Δ/Δ tumors) the region containing the MYC oncogene at 128.8 Mb. 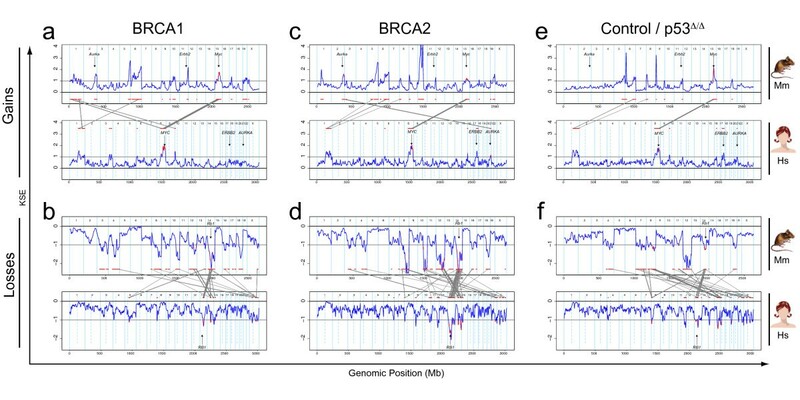 The peak of the human BRCA2-mutated tumors mapped exactly on the MYC oncogene, and the peak of the human control tumor group maps slightly downstream of MYC (ADCY8, 132.21 Mb). All human tumor groups had a second peak on chromosome 8 mapping between EXT1/TNFRSF11B at 119.4 Mb and ENPP2/COL14A1, 120.87 Mb). This second peak was not shared with the mouse tumor groups. In all tumor groups, we found a recurrent region of loss on chromosome 13q (mouse chromosome 14) which is commonly associated with the RB1 gene. Indeed, the overlapping regions of the mouse and human BRCA2 groups include RB1. The overlap of BRCA1 and control tumors mapped to the flanks of these peaks, notwithstanding that loss of RB1 could well drive the loss of this region in tumors of both species. Interestingly, the overlap of all three tumor groups included the region containing INTS6, an annotated tumor related gene (also known as DICE1, Protein deleted in cancer 1). A remarkable similarity between mouse and human BRCA2-mutated breast tumors was that the peak of both the human (chromosome 20) and mouse (chromosome 2) centered exactly on the Aurora kinase A (AURKA) oncogene. Similarly, the human control tumors showed recurrent losses on chromosomes 16q and 17p, and the peaks of syntenic losses in mouse p53 Δ/Δ tumors centered on exactly the same genes on chromosomes 8 (MMP2) and 11 (MAP2K4), respectively. This suggests that these genes (or neighboring genes) may be involved in selection of these CNAs during mouse and human tumor development. Note, however, that the Aurka gain also occurred in mouse Brca1 Δ/Δ ;p53 Δ/Δ tumors and that loss of mouse chromosomes 8 and 11 was not specific for the Brca1 Δ/Δ ;p53 Δ/Δ tumors, suggesting that BRCA2 association of the syntenic gain and BRCA1 association of the syntenic losses are dictated by the human tumor data. Large regions of chromosome 1 were recurrently gained in the Brca1 Δ/Δ ;p53 Δ/Δ tumors whereas shorter regions were gained in the Brca2 Δ/Δ ;p53 Δ/Δ tumors (see Figure 2). Due to this difference in the mouse tumors, there was a BRCA1-specific overlap with human chromosome 1, as all other human tumor groups showed this significantly recurrent gain. It is interesting that the region of overlap encompasses PIK3CB and MDM4. In the BRCA1 and BRCA2 tumor groups of both species, we identified a recurrent loss on human chromosome 14 (mouse chromosome 12), peaking on ARID4A (57.87 Mb) and DACT1 (58.17 Mb). All mouse tumors, including the p53 Δ/Δ group, show this loss, encompassing entire chromosome 12. Whether the region containing ARID4A and DACT1 contains a driver gene for this whole chromosome loss remains to be established. To identify the CNAs that occur significantly more often in mouse BRCA1-deficient tumors compared to control tumors, we compared aCGH data from the mouse Brca1 Δ/Δ ;p53 Δ/Δ tumors with aCGH data from the p53 Δ/Δ tumors using comparative-KC-SMART. Similarly, to determine which CNAs occur significantly more often in the human BRCA1-mutated breast tumors compared to the control tumor group, we used comparative-KC-SMART on aCGH data from human tumors. 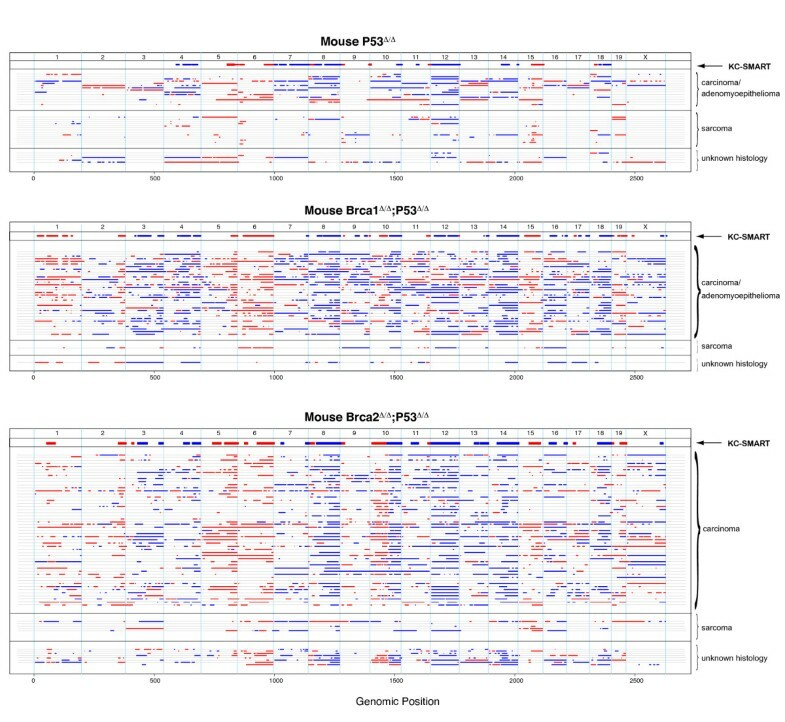 Differentially occurring gains are depicted in Figure 7a and the differential losses are depicted in 7b; top panels represent mouse Brca1 Δ/Δ ;p53 Δ/Δ tumors compared with p53 Δ/Δ tumors and lower panels represent human BRCA1-mutated tumors compared to the control tumor group. We next determined which genomic regions are differentially recurrent in both mouse and human BRCA1-mutated tumors by mapping the orthologous genes of our synteny list to the differentially aberrated regions in both species. The mouse and human orthologues are connected by gray lines between the top panel and the lower panel. We applied the same analysis to the mouse and human BRCA2-mutated tumors (Figure 7c,d). Cross species comparative-KC-SMART analyses. (a) The upper section shows the KSE curves of the gains of the mouse Brca1 Δ/Δ ;p53 Δ/Δ (blue) and p53 Δ/Δ (gray) tumor groups. The positions of the genes that map in regions that are aberrated significantly more often in the Brca1 Δ/Δ ;p53 Δ/Δ compared to the p53 Δ/Δ group are depicted in red on the blue curve and shown as red bars on the bottom of the panel. Vice versa, the positions of the genes that map in regions that are aberrated significantly more often in the p53 Δ/Δ compared to the Brca1 Δ/Δ ;p53 Δ/Δ group are depicted in green on the gray curve and shown as green bars on the bottom of the panel. Similarly, the lower section shows the KSE curves of the gains of the mouse human BRCA1-mutated (blue) and sporadic (gray) tumor groups. Those genes that map to syntentic regions that are differentially aberrated in tumors of both species are connected between the two plots by gray lines. Thicker connecting lines represent multiple genes that map to one syntenic region of gain. (b) Idem: differential losses of the mouse Brca1 Δ/Δ ;p53 Δ/Δ (blue) and p53 Δ/Δ tumor groups (gray) and human BRCA1-mutated (blue) and sporadic tumors(gray) (lower section). (c,d) Idem: differential gains and losses of the mouse Brca2 Δ/Δ ;p53 Δ/Δ (blue) and p53 Δ/Δ tumor groups (gray) and human BRCA2-mutated (blue) and sporadic tumors(gray) (lower section). Gains: No genes were differentially aberrated in tumors of both species. Cancer related genes that map in the overlapping regions are shown in Figure 8 (abbreviated list) and Additional file 9 (complete list). Regional CNAs that occur significantly more often in the Brca1 Δ/Δ ;p53 Δ/Δ or Brca2 Δ/Δ ;p53 Δ/Δ mouse tumor groups compared with the p53 Δ/Δ control tumors are listed in Additional file 7. For the complementing human data see Additional file 8. The regions of human-mouse overlap determined by comparative-KC-SMART are listed in Figure 8 (regions with single overlapping genes were left out, for complete list see Additional file 9). Between the human and mouse, control tumors show no syntenic regions of overlap in any of the comparisons, therefore, the orthologous genes mapping to these regions are not connected. Regarding regions encompassing more than one gene, there are 26 regions that overlap between mouse and human BRCA1-mutated tumors (10 overlapping BRCA1-specific gains and 16 losses), compared to only 4 overlapping BRCA2-specific losses. This marked difference is due to the lack of differential gains and losses between the human BRCA2 tumors and sporadic control tumors. Genes in overlapping recurrent CNAs of human and mouse breast tumor determined by cross species comparative-KC-SMART analyses. Overview of genes in regions found by cross species comparative-KC-SMART analysis (Figure 7). Listed are genes that map to significantly differentially gains and losses that overlap (a) between mouse Brca1 Δ/Δ ;p53 Δ/Δ mammary tumors (compared to p53 Δ/Δ tumors) and human BRCA1-mutated breast tumors (compared to control tumors) and (b) between mouse Brca2Δ/Δ;p53Δ/Δ mammary tumors (compared to p53Δ/Δ tumors) and BRCA2-mutated breast tumors (compared to control tumors). Idem Figure 6. For complete list see Additional file 9. The largest overlapping BRCA1-specific gain between mouse and human BRCA1-mutated breast tumors maps to human chromosome 1 and to mouse chromosome 6. This region harbors the GADD45A gene, shown to be induced by BRCA1 independently of p53 , and implicated in regulating centrosome duplication and maintaining genome integrity . We speculate that the GADD45A gene cannot be induced in BRCA1-deficient cells, and that the necessity for its activity during cellular division could select for its expression by amplification. The gain on human chromosome 7 maps to mouse chromosome 6. This is one of the few gains in the human tumors that are seen in the BRCA1-mutated tumors but not in the control tumors. Similarly, the gain in the centromeric region of mouse chromosome 6 is also not seen in the p53 Δ/Δ tumors, suggesting that in this setting, this gain is BRCA1-specific in tumors of both species. The mouse tumors have a peak on the EXOC4 gene (alias SEC8, at 132.9 Mb), and the human peak at the CALD1 gene (Caldesmon 1, at 134.2 Mb). SEC8 is involved in cell-cell adhesion and is essential for the development of epithelial cell surface polarity. Caldesmon is a potential actomyosin regulatory protein found in smooth muscle and nonmuscle cells. Whether amplification of these genes selects for tumor development remains speculation. There are several interesting cancer-mutated genes in this region such as SMO (smoothened, at 128.63 Mb) which was previously associated with basal-like carcinomas  and the BRAF oncogene (140.17 Mb) which regulates proliferation differentiation, senescence and apoptosis through the RAS/ERK pathway. Since these two genes roughly mark the edges of the common amplicon it remains unclear whether these genes are involved in driving the development of this gain. The overlapping gain on the telomeric end human chromosome 12p maps to the telomeric part of mouse chromosome 6. The mouse tumors have a small peak on CLEC12A, but the actual peak of the amplicon is at the end of chromosome 6, which encompasses the oncogenic Kras gene; however, this region is not part of the human-mouse overlap. The human tumors have a peak on STRAP (alias MAWD, at 15.93 Mb) which has previously been shown to be overexpressed in breast cancer . The driving gene(s) of this overlapping gain might therefore differ between mouse and human breast tumors. Loss of human chromosome 5q is strongly associated with BRCA1-mutated tumors . This region might therefore contain tumor suppressor gene(s) that collaborate with BRCA1-loss in tumorigenesis. The first part of human chromosome 5q maps to the telomeric half of mouse chromosome 13, which is not lost significantly more often in the mouse Brca1 Δ/Δ ;p53 Δ/Δ tumors compared to the p53 Δ/Δ tumors, with the exception of the telomeric region. The human peak (which is only a small peak adjacent to a more intense peak) and the mouse peak localize at the region encompassing the MAP3K1 and PLK2 genes. There are two chromosome 5 syntenies mapping to consecutive regions on mouse chromosome 18. The SPINK7 gene (also known as ECRG2, esophageal cancer related gene 2) maps close to the peak of both the mouse and human loss. Again, its involvement in driving the chromosome 5 loss remains to be established. The BRCA1-specific loss on human chromosome 12 maps to mouse chromosome 10 and consists of three separate losses. The first part peaks at the GLS2 gene, whereas the mouse loss peaks at the ITGA7 gene. This loss contains several interesting genes such as CD63 (melanoma-associated antigen), CDK2, ERBB3, CDK4 and the DDIT3, but since these genes are part of the mitogenic signaling pathways, it is unlikely that these genes are drivers of this loss. The second loss on human chromosome 12 is a peak region encompassing five genes, of which one, KITLG, is listed as a putatively cancer related gene. The third loss on chromosome human 12 also maps to mouse chromosome 10. The mouse loss peaks on APAF1, involved in apoptosis, and the human tumors show a peak at the end of the loss, just outside the overlap. The human BRCA2-mutated tumor group is very comparable to the control tumor group, and therefore shows only one overlapping region with mouse Brca2 Δ/Δ ;p53 Δ/Δ tumors. The human chromosome 13 is one consecutive loss previously associated with RB1, which maps in different parts to mouse chromosome 14. Indeed, RB1 (47.95 Mb) maps to this loss, close to the peaks of both mouse (TSC22D1 at 43.9 Mb) and human tumors (OLFM4 at 52.5 Mb). During tumor development, acquired genetic aberrations that confer selective advantage will become enriched in the tumor cell population. To identify the drivers underlying the gains and losses selected for during breast cancer development, we made use of the synteny between human and mouse genomes . Syntenic gains and losses that occur in both the mouse and human oncogenomes may harbor evolutionary conserved genes or genetic elements that are causal to tumor development in both species. Indeed, comparative aCGH analyses showed that many genetic aberrations are conserved between human and mouse neuroblastomas [31, 32], ovarian cancers , hepatocellular carcinomas , melanomas  and T-cell lymphomas . In this work, we analyzed and compared aCGH data from a large series of mouse and human BRCA1- and BRCA2-mutated breast cancers, in order to obtain a complete collection of genes and loci that are recurrently gained or lost in tumors of both species. We find that amplification of the MYC locus and the loss of the RB/INTS6 locus is evolutionarily conserved in mouse and human mammary tumor development, and that AURKA amplification is conserved in mouse and human BRCA2-mutated tumors. However, aside from these similarities, we also find recurrent aberrations in mouse and human oncogenomes that do not overlap. Because mouse models enable targeted deletion of specific gene(s) in a defined genetic background it is possible to assess the specific function of this gene within an organism. With our mouse models, we analyzed the impact of BRCA1 or BRCA2 loss on the oncogenome, in a p53 deficient background. KC-SMART profiles of mouse Brca1 Δ/Δ ;p53 Δ/Δ and Brca2 Δ/Δ ;p53 Δ/Δ mammary tumors showed that significantly recurrent genomic aberrations largely overlap with recurrent aberrations in p53 Δ/Δ tumors and that these common aberrations occur more frequently in Brca1 Δ/Δ ;p53 Δ/Δ and Brca2 Δ/Δ ;p53 Δ/Δ mammary tumor compared to the p53 Δ/Δ tumor group. This suggests that BRCA1 or BRCA2 loss intensifies the profile of aberrations seen in the p53 Δ/Δ tumor group. We find that the p53 Δ/Δ tumors that are BRCA proficient more often gain or lose entire chromosomes during tumor development. In contrast, Brca1 Δ/Δ ;p53 Δ/Δ and Brca2 Δ/Δ ;p53 Δ/Δ tumors have an increased amount of partial chromosomal gains and losses, presumably because they have accumulated more inter- and intrachromosomal DNA damage as a result of error-prone DSB repair in the absence of homology directed DNA repair. The inability of these cells to properly repair DSBs might allow selection of gains and losses more specifically tailored around the relevant genes in a region. Interestingly, most gains and losses found in the p53 Δ/Δ tumor group are intensified by Brca1 or Brca2 loss but some are not, such as the gain on chromosome 15 and the losses on chromosomes 7 and 12. These regions may therefore be subject to a differential selection pressure during tumor development. It appears that cell type also plays an important role: the carcinomas of the p53 Δ/Δ tumor group seems to have more genomic damage compared with the carcinosarcomas. This may be the reason that BRCA1 and BRCA2 loss gives rise to a more aggravated DNA damage profile, as >90% of Brca1 Δ/Δ ;p53 Δ/Δ tumors and Brca2 Δ/Δ ;p53 Δ/Δ mammary tumors are carcinomas, compared to half of the p53 Δ/Δ mammary tumors, of which the other half are sarcomatoid. This suggests that in these mouse models BRCA1 loss and BRCA2 loss blocks cellular differentiation as suggested previously , or alternatively, that BRCA1 and BRCA2 loss are not tolerated in more differentiated cells. Despite their common p53 deficient background, some aberrations may be more prone to arise in a BRCA1 deficient cell, whereas others are more likely to occur in a BRCA2 deficient cell. For example, the recurrent gain on chromosome 1 or the losses on chromosomes 4 and 9 of the Brca1 Δ/Δ ;p53 Δ/Δ tumors are less common in the Brca2 Δ/Δ ;p53 Δ/Δ tumors. Likewise, the prominent gain on chromosome 10 is found in half of all Brca2 Δ/Δ ;p53 Δ/Δ tumors, and in approximately 1/8 of the Brca1 Δ/Δ ;p53 Δ/Δ tumors. In addition, it appears that in a p53 deficient background, Brca1 loss gives rise to more genomic aberrations than does Brca2 loss. Together, these differences in tumor profiles suggest that BRCA1 and BRCA2 have different functions in DNA repair pathways, however, we have not been able to identify the nature of this difference using our aCGH profiles. Cross species comparison of genomic aberrations in human and mouse tumors may identify conserved genomic regions likely to be important for development in both species. Tumors from genetically engineered mouse models often do not show the high levels of chromosome instability associated with human cancers , presumably because the engineered mutations predispose to rapid tumor formation and thereby circumvent the long incubation time required for accumulation of genomic mutations in human tumorigenesis. The increased amounts of genomic alterations in tumors from mice with engineered telomere dysfunction or defects in DNA damage checkpoints or DNA repair allows comparison of genomic alterations with human tumors that would not be possible in mouse models without chromosomal instability . In our analysis, we compared aCGH profiles from human BRCA1/2-mutated and sporadic breast cancers with profiles from mouse p53 Δ/Δ , Brca1 Δ/Δ ;p53 Δ/Δ and Brca2 Δ/Δ ;p53 Δ/Δ mammary tumors. We assume that DNA damage repair deficiency in the mammary epithelium of these mice allows a comparable selective advantage in tumor formation as in human breast epithelial cells. Indeed, all human tumor groups showed a recurrent gain on chromosome 8q, likewise all mouse tumor groups showed a recurrent gain on its syntenic region, on chromosome 15, centering exactly on the MYC oncogene. This suggests that MYC gain is evolutionarily conserved in mammary tumor development from mouse to man. Likewise, the chromosome 13 loss, associated with RB1 loss  occurs in all human and mouse tumor groups, and all overlapping regions encompass the INTS6 gene. Similar to MYC gain, RB1/INTS6 loss could be evolutionarily conserved in mammary tumor development. The defined initiating lesions and similar genetic background of mouse mammary tumors permits identification of recurrent genomic aberrations linked to certain genetic predispositions. Indeed, the amplification peak on human chromosome 20 overlapped with the syntenic amplification peak on mouse chromosome 2 of the Brca1 Δ/Δ ;p53 Δ/Δ and the Brca2 Δ/Δ ;p53 Δ/Δ tumors, at the Aurora Kinase A gene. The AURKA gain has been previously associated with BRCA2-mutated breast tumor development  but our findings suggest that the functional interaction between AURKA and BRCA2 may be evolutionarily conserved. The mouse Brca1 Δ/Δ ;p53 Δ/Δ tumors also showed the gain on chromosome 2 but the p53 Δ/Δ tumors, on the other hand, did not show this gain at all, suggesting that this gain may selectively develop in a homologous repair deficient (HRD) background. For most other overlapping gains and losses reported in the results section, it is still difficult to associate a driver gene with a gain or a loss. Also, gains known to be important in human BRCA1-mutated breast cancer show no (e.g. 3q gain) or only partial (e.g. the 5q loss) overlap with the mouse gains and losses. The human 3q gain is associated with PIK3CA overexpression; possibly, mouse tumors may find alternative ways to overexpress this gene or a functional homologue. Alternatively, PIK3CA overexpression might not provide a selective advantage in these mouse tumors, or mouse tumors in general. The regions susceptible for amplification or deletion in the mouse genome and the human genome may not be the same due to, for example, different nuclear chromosomal folding or genomic organization of synteny blocks, resulting in a differential development of the oncogenome during mouse and human tumor development. These findings add to previous findings of differences between mouse and human breast cancer development such as that activation of Wnt and/or its pathway members are commonly found in mouse but not in human spontaneous breast tumors, differences in metastasis patterns, or that few mouse models accurately represent ER positive human breast cancers . In this work we have found some important genotypic similarities between mouse and human cognate cancers, such as the MYC gain and the RB/INTS6 loss, but also important differences such as the chromosome 10 gain in mouse Brca2 Δ/Δ ;p53 Δ/Δ tumors and the 3q gain in human BRCA1-mutated tumors. In our mouse models, we find that BRCA1 and BRCA2 loss clearly have different impacts on tumor development. However, the distinct features of mouse Brca1 Δ/Δ ;p53 Δ/Δ and Brca2 Δ/Δ ;p53 Δ/Δ tumors did not translate to distinct features of human BRCA1 and BRCA2 mutated tumors and vice versa. A reason for this could be that tumor development in our mouse models is a fast, accelerated version of the relatively slow process of tumor development in humans. Simultaneous and homozygous deletion of the mouse Brca1, Brca2 and p53 genes leads to immediate cellular transformation, whereas human germline BRCA1 and BRCA2 mutations are initially heterozygous [41, 42]. Human TP53 mutations are somatic and can be acquired in myriad different ways, possibly resulting in different phenotypes . In addition, the difference in make-up of the mouse and human genome, such as the genome wide organization of syntenic regions, and/or overall differences between mouse and human mammary gland biology may result in selection of other regions and genes during the course of mouse and human breast cancer development. These differences should be taken into account when using K14cre;Brca1 F/F;p53 F/F and K14cre;Brca2 F/F;p53 F/F mouse models for preclinical studies. This work was supported by grants from the Dutch Cancer Society (NKI 2002-2635), the Netherlands Organization for Scientific Research (NWO Vidi 917.036.347) and the Susan G. Komen Breast Cancer Foundation (BCTR0403230). The authors thank Dr. Piet Borst and Dr. Hein te Riele for critically reading this manuscript. HH, EvB, PN and JJ conceived and designed the study. HH, EvB, AV, XL, SAJ, SK, ES, RK and JJ performed experiments. HH, EvB, PN and JJ analyzed the data. CNK, AV and LFAW contributed analysis tools. HH, EvB, PN and JJ wrote the paper. All authors read and approved the final manuscript.